Hey all! Today I've got a REAL special treat for you straight from the depths of Reddit. I always enjoy seeing an innovative new idea but the problem that usually comes up is, is it viable in the high ranks and Legend? Well Reddit user /u/superolaf posted up a decklist that I REALLY enjoyed and had to test out immediately, it's an interesting combination of control Hunter with a pretty crazy combo using Master Oakheart . Oakheart was used early on in the new meta when the expansion hit, in a weird meme warrior deck that went around for a short while on Reddit. The joke was that someone had posted it up under the name of a professional streamer and other people started copying the decklist thinking it was a top tier deck. 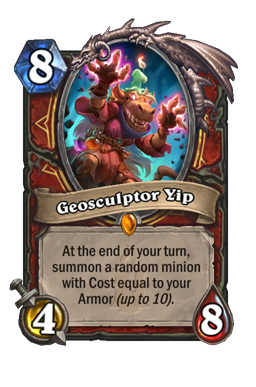 It used the new Warrior legendary, Geosculptor Yip , and Master Oakheart with some control aspects but it ended up just being a joke and quickly faded from the meta. But when I saw this decklist and read his idea for using Oakheart, I instantly fell in love. Originally I thought Oakheart recruited minions based on mana cost, not attack power, which changes EVERYTHING since you can pull some really high cost minions based on their attack. 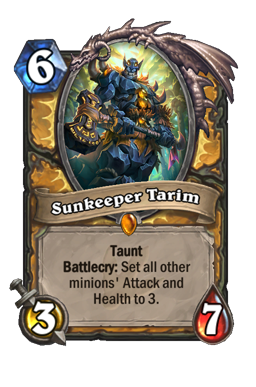 The combination he proposed uses Tundra Rhino as the 2 attack minion to give charge to your beasts which also includes Stoneskin Basilisk , your 1 attack minion, so you have a 1/1 Divine Shield Charge Poisonous, and either Cloaked Huntress (which I'm actually considering taking out) or Vicious Fledgling which can be really nasty since it gets Charge! 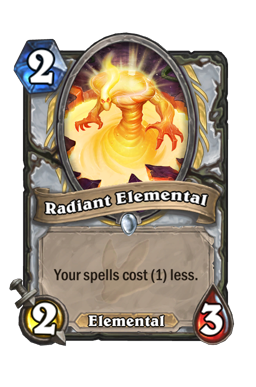 This allows you to have a 2/5 beast attacking, a 1/1 poisonous that can kill anything and a 3/3 that can attack face and possibly get Windfury or some other great Adapt effect. Superolaf was able to climb from Rank 15 to Rank 3 with this decklist and with my changes I was able to do pretty well going from Rank 5 to Rank 3 with a 60%+ win rate. The crazy part is that this was only with a few days of piloting this deck which means I was still getting used to mulligans and matchups. I have two videos up on my Twitch here: twitch.tv/whoisfuskee where you can watch me play the deck at Rank 5, going up to Rank 3 with relative ease especially in the second video. I plan to play this deck some more in the next few days so if you like the decklist and want to see some gameplay, make sure you check out my channel and see how it works. Well without further delay let's get into the deck and check out what kind of cards we're using in this weird hybrid control Hunter deck! On the decklist to the right I've posted up /u/superolaf's original decklist without my changes so you can copy it directly from him, but here are some quick immediate changes I made that I think make the deck much safer in this current meta that has a lot of Murloc Paladin aggro going around. -1 Deadly Shot , -2 Cat Trick , -2 Kill Command +1 Explosive Trap , +2 Unleash the Hounds , +1 Misdirection , +1 Vicious Fledgling My reason for these changes is because aggro is a huge problem right now. /u/superolaf talks about how the deck has an unfavored matchup against Murloc Paladin and with these changes you have a lot more answers against them while also having some more answers against Cubelock, the other big deck in this meta. 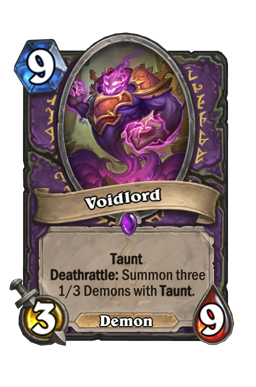 Explosive Trap and Unleash the Hounds will help you keep control of the early game aggro while also giving you an answer against Voidlord 's little Taunt Voidwalker s it leaves behind when it dies. 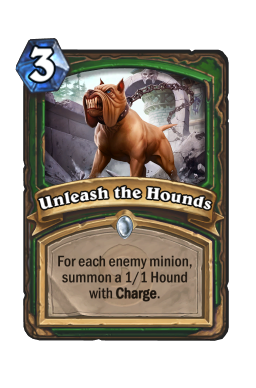 Setting up an Explosive Trap or Deathstalker Rexxar into an Unleash the Hounds can wipe out those Taunts and give you that opening to go for lethal damage. 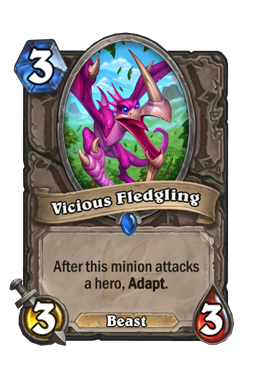 I also added an extra Vicious Fledgling into the deck because I REALLY like the Master Oakheart combo when it pulls Vicious Fledgling , giving you an immediate threat to attack with. This is one of the strongest packages that Hunter has to offer. 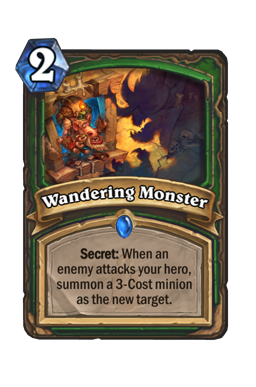 Secrets are great because they're a way to mess with your opponent but with the addition of Lesser Emerald Spellstone in the recent expansion, secrets have gotten way better for Hunter. Explosive Trap : This is your big anti-aggro, anti-Murloc, anti-Silver Hand Recruit card. Just like your other secrets it helps activate your Spellstone and your Eaglehorn Bow while also giving you some great defense against the early game aggro that most control decks lose to. Don't be afraid to use this on just one or two minions at the beginning of the game, it's worth it as long as you can stabilize the first few turns and not let Murloc Paladin pump up their small minions. 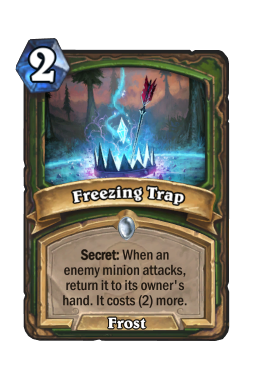 Freezing Trap : Amazing stall tactic card that also beefs your weapon and your spellstone. Very useful against Cubelock since they will usually only get to attack with their lategame big minions like Doomguard , Voidlord or Carnivorous Cube which just bounces it away and lets you keep control of the field. 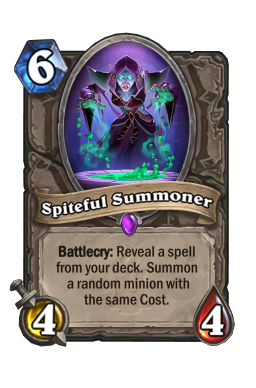 It also works great against Spiteful Summoner Priest decks since you can kill the 4/4 and then let their big minion bounce back to their hand. Wandering Monster : Another great early game defense but sometimes very random. 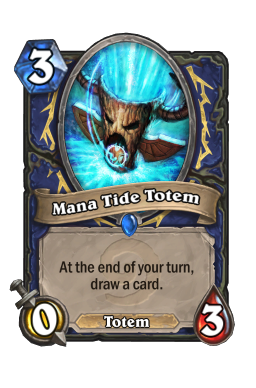 Every once in awhile you'll get something like Mana Tide Totem which just gets killed quickly but other times you can get a nice big 3/4 that can eat a minion and also attack the next turn. Pretty much play this as early as possible so you can try your RNG at a good minion. Misdirection : This is mostly just a placeholder in the deck right now. I wanted more secrets in the deck to activate our Eaglehorn Bow and Lesser Emerald Spellstone but there aren't really any good choices left. I'll explain below why I don't like Cat Trick and besides that, the only real choices are either Misdirection or Snipe . I tested Snipe a little and it didn't end up working that well. 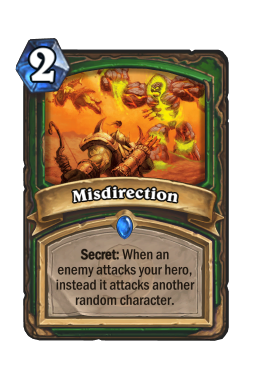 Misdirection is pretty random but there are definitely times where it can totally save you or put your opponent within lethal range. I'm tempted to try replacing this with another Spellbreaker since Silence is REALLY good right now against Cubelock but I will go over that down below in my alternative choices section. Consider this an open spot for you to play around with and test cards out in this deck. 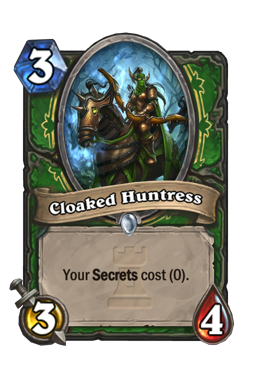 Cloaked Huntress : I have two issues with this card in the deck. My first issue: When you play this minion on Turn 3, you're rarely dropping 2-3 secrets on top of it. 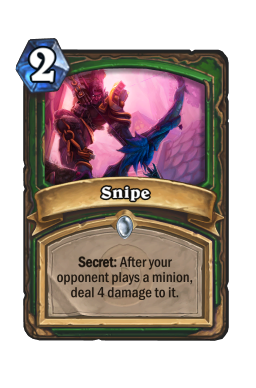 The Hunter secrets don't really stack well since a lot of them trigger off the same ability so you'll rarely play multiples in one turn. I think the most I've ever played is 2 secrets and even then, it wasn't that advantageous. 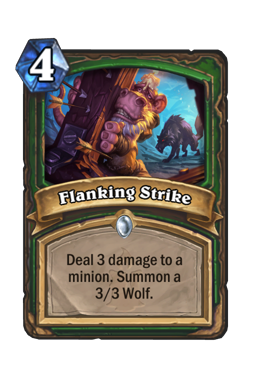 The other issue is that this will sometimes get pulled from Master Oakheart leaving you without a Vicious Fledgling to attack with. While it does give you something in case you drew both of your Fledglings, I find that it hasn't really done its job in most of the games I play and it's honestly the next thing I'm going to playtest taking out. I plan to put back in Kill Command but I will go over that in the section below titled alternative choices. 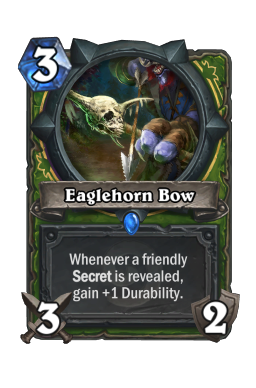 Eaglehorn Bow : This card is just amazing with the secret package. 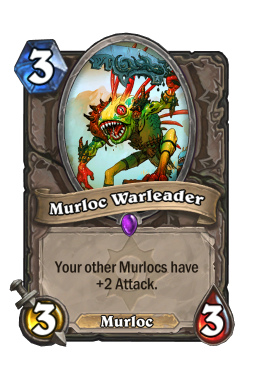 3 damage kills most early game minions in this meta and can get rid of a lot of pesky things like Radiant Elemental , Murloc Warleader , etc. Combined with the ability to gain durability from your secrets, I honestly think this is the best weapon in the game right now. 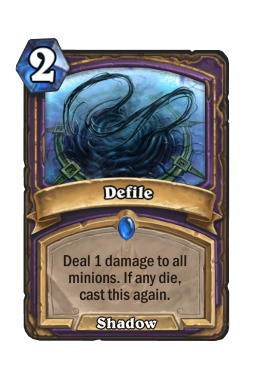 Use it to remove your opponent's minions if you're up against aggro, but if you're up against control like Cubelock, don't hesitate to attack their face, you have a lot of secrets in the deck that can give you durability back and the damage goes a long way. 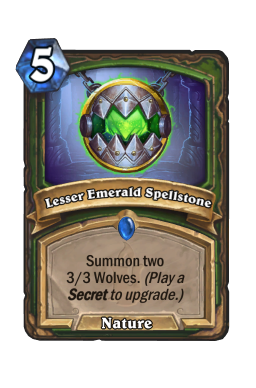 Lesser Emerald Spellstone : This card made secrets so much stronger in the Hunter deck and can seal a game against most opponents if you're able to get it out on Turn 4 or 5 with the maximum wolves. 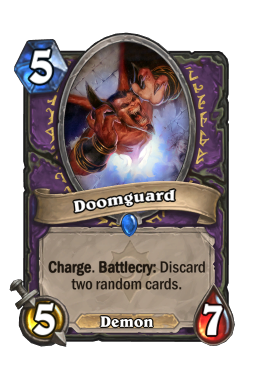 Playing two secrets will upgrade this card so you summon four 3/3 wolves and there is only really one class that has an easy answer against that on Turn 4/5, Cubelock. 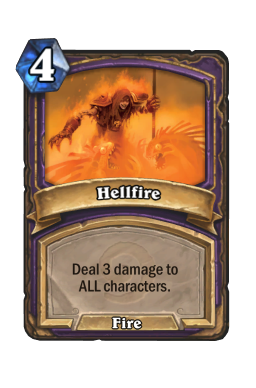 If you're playing against Warlock, don't try to play this card, you will get Hellfire 'd or Defile 'd and lose everything very easily. Against everyone else though, this card is AMAZING. 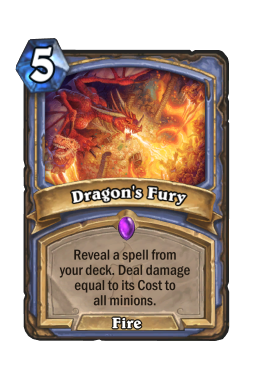 Mage has Dragon's Fury which can usually deal with these but it still forces them to waste their whole turn to do that and opens them up for the next turn. I usually mulligan pretty hard for these since they will only upgrade if they are in your hand when you play the secret, so it's important to have these early before you start dropping down secrets on Turn 2-3 so it's ready on Turn 5 to drop the max amount of wolves. These are the Master Oakheart combo cards that allow you to drop a big army on Turn 9. The best part about this combo is that unlike other combos that require you to hold all the cards in your hand, you can just play these cards when you draw them like they're a normal minion. 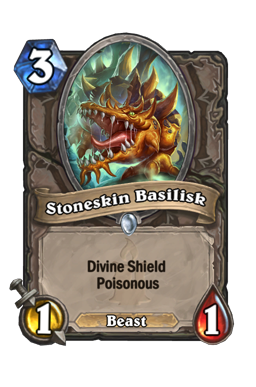 Stoneskin Basilisk : This card is amazing in the combo since you are able to attack and kill something big for free, losing your divine shield and poisoning a minion to kill it instantly. I've used this against things like Spiteful Summoner summons and Sunkeeper Tarim , opening the way for my other big beasts to come through and attack. This also isn't bad to play on Turn 3 because most decks don't have an easy way to kill this minion. Even Mage/Druid/Rogue requires you to get through that divine shield first and if they're wasting a card to do that, it's still a 1 for 1 trade. Vicious Fledgling : This card is an old favorite of mine from back when it ruled Arena and I love using it in this deck. You can drop this guy on Turn 3 with no fear of it getting killed because who cares, this isn't an aggro deck, it doesn't NEED a Turn 3 Fledgling to win. If you're able to get it into play and attack, this is one of those cards that snowballs so much that you can win with just this guy alone. This deck also has great control cards like Freezing Trap and removal spells that help keep it alive. And needless to say, when it comes to the Oakheart combo, getting one of these out and attacking can do a potential 6 free damage if you get Windfury! /u/superolaf only runs 1 but I highly recommend running both. Tundra Rhino : It's pure genius that Oakheart is able to pull this minion as a 2 attack minion since it costs a big whopping 5 mana! Being able to get such an expensive minion for so cheap is crazy good and the stats are amazing on this minion. The 5 health makes it difficult to remove against things like Flamestrike and the ability to give all your beasts charge is INSANELY good in this deck! Not only is it great with the combo, with cards like Flanking Strike and Lesser Emerald Spellstone you can actually surprise your opponent with lethal damage. 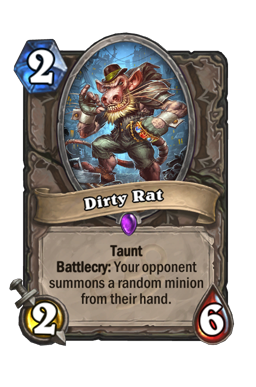 In one of my games, my opponent uses Dirty Rat to pull this into play and I respond by playing Lesser Emerald Spellstone fully upgraded for four 3/3 Charge minions. This card can make this deck pretty ridiculous. I wouldn't play it by itself but for 8 mana you can combo this with Vicious Fledgling to attack on the same turn or for 10 mana you can combo this with an upgraded Lesser Emerald Spellstone . 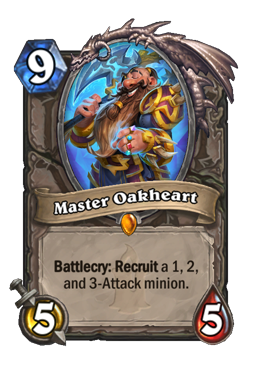 Master Oakheart : The KING of the deck! I honestly have not had any problems with this card. It rarely shows up in my hand and when it does, it usually isn't a problem. If you are able to control the game and get to turn 9, as long as you haven't drawn all of your other minions you can throw him down and create an army out of nothing. For 9 mana you can get an extra 11 mana worth of minions and the attack value on them is just ridiculous. He's also a 5/5 as well which is a pretty decent size since it avoids most board removal and can pack a big punch. I had to craft this card for this deck and I have not regretted it one bit. These are just a few Hunter spells that help you control the game while also making sure your deck is only filled with the important minions that Master Oakheart needs to pull out, while still supplying you with minions to attack with. 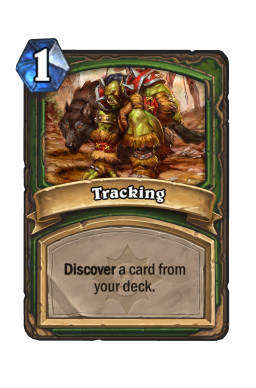 Tracking : This is basically your only "card draw" in the deck, since it allows you to sort of draw 3 cards and then discard 2. This will help you filter through your deck and find the control answers you need, like secrets to activate your secret package, or things like Unleash the Hounds to counter your opponent's aggro field. The discard effect can be really annoying sometimes if you NEED to take something and have to end up discarding Deathstalker Rexxar but that's just what this deck has to do sometimes, take what you need at the moment. 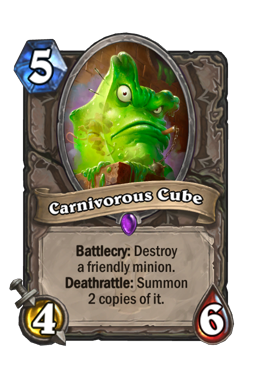 Animal Companion : There isn't much to say about this card, it's a great minion for a cheap cost no matter what you get, even Leokk can make all you Unleash the Hounds minions into 2/1s with charge. Helps keep your deck empty of minions so you don't have problems with Oakheart. You can also combo this with Tundra Rhino in case you get the 4/4 Misha, still letting you attack with it like it was a Huffer. 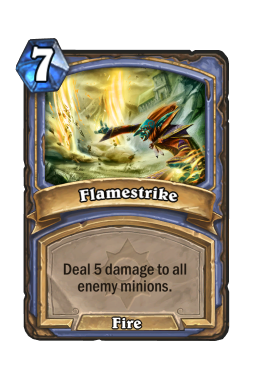 Flanking Strike : Not much to say about this card, good removal spell that also gives you a decent sized minion. 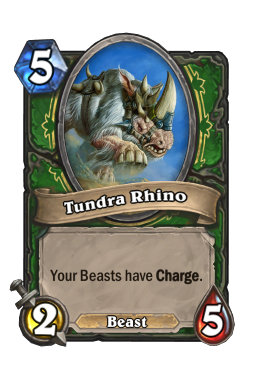 Can be combo'd with Tundra Rhino to remove something and get a 3/3 Charge, or if you need to deal 6 damage to something, you can deal 3 and then attack it. Unleash the Hounds : This was tested out after the first little bit of playing with this deck and it made a HUGE difference in this meta. Right now there's a lot of Paladin going around, Murloc Paladin and Silver Hand Recruit Paladin. This card alone can counter both of those decks and wipe entire fields with just one card. 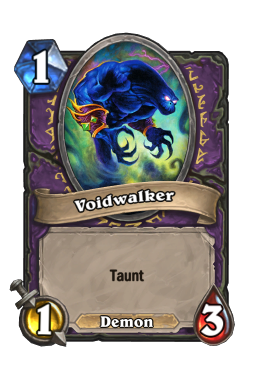 It's also very effective against Voidlord in Cubelock if you have to try and rush down all the Voidwalker s it leaves behind. 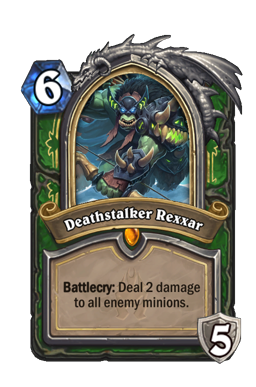 Every Hunter control deck is always going to play Deathstalker Rexxar , it's a great card that will steadily supply your hand with annoying minions for your opponent to deal with. 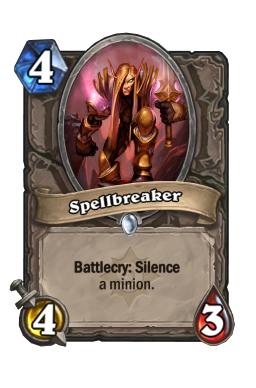 Also in this section is the big answer against the pesky Cubelock deck that is around right now: Silence! Spellbreaker : This card is so important in this meta that I'm considering adding an extra one in the deck. Cubelock has so many potential targets that I always end up using one and then needing another when I see a second Voidlord come out. It's also helpful against big Taunt minions if you're trying to get through with your 3/3s. I highly advise not taking this out of the deck if you think you don't need it, because you do. Cubelock is one of the biggest decks in this meta and having the silence is a really powerful answer to a lot of their stuff. It also works great against Murloc Paladin because you can get rid of their Taunts and attack into their murlocs or disable their Murloc Warleader . Deathstalker Rexxar : A powerful single card for so many reasons, 1. It is a board wipe against aggro decks like Murloc Paladin. 2. 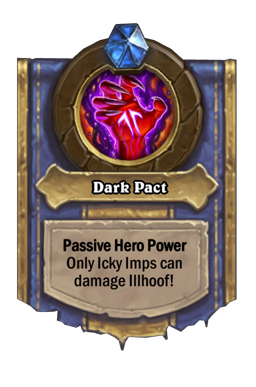 It gives you armor which can help you survive an extra turn against things like aggro or more importantly, against the Secret Mage decks that are in the current meta. 3. It gives you a much better "Control" hero power that can start filling your hand up with powerful minions. The various abilities you can get off those minions like Lifesteal, Taunt or a big minion with Charge can help you take a big control of the game. Honestly, every Hunter control deck should have this card, it's amazing. These are the cards I removed from /u/superolaf's decklist but they're still viable cards if you want to remove something out of my decklist and put something in its place. I'll explain my reasons for taking them out of the deck and possible reasons to put them back in. Cat Trick : I am not a fan of this card. Against some decks it's not that bad, getting a 4/2 Stealth early, but if you're playing around Rank 5 and above your opponent will almost always know to try and play around it. 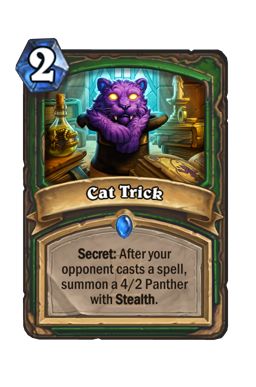 If you're playing this on Turn 2, most intelligent opponents are going to realize that it COULD be a Cat Trick so they just wait for the best time to activate it and then board wipe you. It's still okay in situations if you are able to play it and get it activated, but I'm telling you, most people can see through it at the high ranks and you'll usually just end up wasting a card and a turn playing it, except to pump up your secret package. 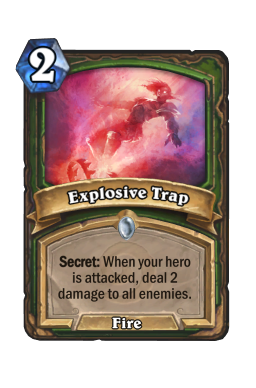 Next week I'm writing an article about how to play around Secrets and I'll go into more detail about how most decks can avoid this card. 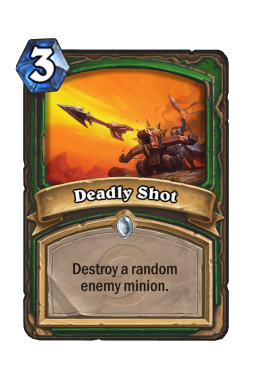 Deadly Shot : This was in the original decklist but it's awful in this meta. There are far too many aggro/minion based decks and rarely do you get a solid Deadly Shot off. I'm not going to talk much about this card, it just doesn't fit with the current meta, I would advise not using it. 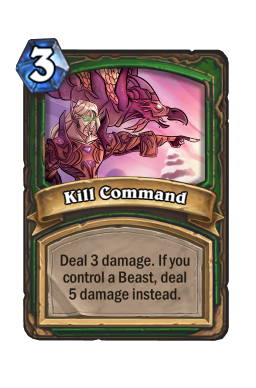 Kill Command : I initially took this card out of the deck because you don't really have a lot of beasts that stay in play, which means this card usually does 3 damage. 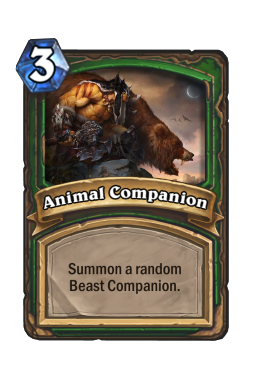 The deck also doesn't have any cheap beasts which means if you're playing a beast from hand and using this card, you're usually playing Animal Companion or Vicious Fledgling which means you're spending 6 mana to get that 5 damage off. With that being said, I'm thinking about taking out Cloaked Huntress and putting this back in because I think it's a really good win condition against Cubelock. A lot of Cubelock players get themselves really low around the 10-15 health area before they stop damaging themselves. 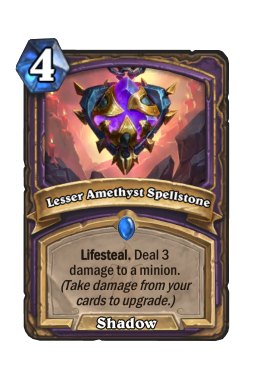 They use things like Lesser Amethyst Spellstone and Dark Pact to heal up but if you can catch them off guard, even for 9 mana, Vicious Fledgling into double Kill Command can catch a warlock off guard and finish them. Spellbreaker : This wasn't a card that was taken out but is being highly considered for an additional slot. The Silence effect is so powerful right now in this meta that I really think this deck needs another one in. 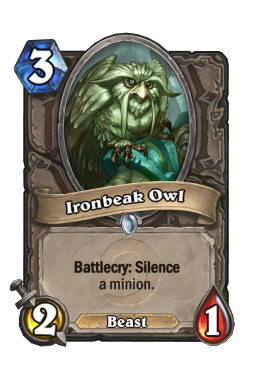 Originally I was also considering Ironbeak Owl but I quickly realized that if I threw that in, I would ruin my own Master Oakheart combo, so beware of that! AAECAR8E8gXDCIbTAvHqAg21A4cEyQS7BZcI2wn+DMS0Ap/CAt3SAt/SAuPSAtLTAgA= To use this code, highlight that string of letters/numbers and then right-click and Copy or press Ctrl+C to copy it to your clipboard. Then go to create a new deck and Hearthstone will ask you if you want to create a deck using your clipboard and it will autofill the deck for you!